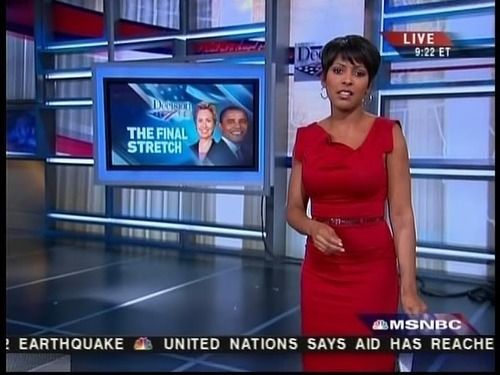 MSNBC (1996- ), along with CNN and Fox News, is one of the three main cable news channels on American television. Since 2008 it has been making itself into a liberal (centre-left) counterpart to Rupert Murdoch’s hard-right Fox News, trying to beat Fox News at its own game. Ownership: NBC, which in turn is owned by Comcast. NBC was owned by General Electric, in whole or in part, from 1986 to 2013. The “MS” stands for Microsoft, which once owned half of MSNBC. Political viewpoint: white liberal Democrat. It was an Obama cheerleader even before he became president. Viewers: About 400,000 or so nightly (2008-2012) – currently about the same as CNN, less than half of Fox News. Fans: Part of the media diet of Terry Gross (NPR), Sheryl Salomon (The Root), Ann Coulter (Fox News) and David Corn (Mother Jones). One of its best shows is Melissa Harris-Perry’s Nerdland. She is a black professor who uses words like “marginalized” and “cisgendered”. She invited Sean Bell’s widow to the show. Amazing stuff for American television. Yet she never seems to say much bad about President Obama. Or the Democrats. More biased than Fox News: In the week before the 2012 election MSNBC did not run a single bad story about Obama nor a single good one about Romney. Not even Fox News was that bad! Only one host seemed to openly oppose Obama’s drone policy – Joe Scarborough, their token Republican. Hires Obama cronies: After the 2012 election, MSNBC hired David Axelrod, the head of Obama’s campaign, and Robert Gibbs, a former Obama press secretary. 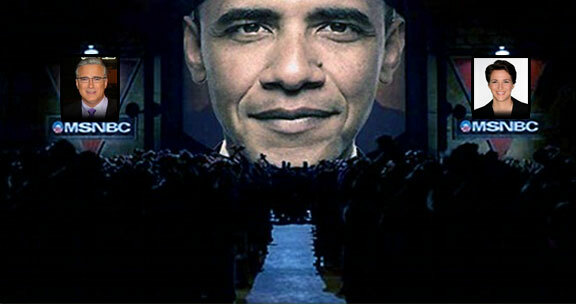 Obama hero worship: MSNBC talked about putting Obama on Mount Rushmore. Narrow range of opinion: MSNBC used to have right-wing talking heads like Pat Buchanan, Alan Keyes, Ann Coulter and Tucker Carlson. Now it just has a token Republican, Joe Scarborough. Even the range of left-wing opinion is limited: they got rid of Phil Donahue in 2003 for being against the Iraq War. Obama critic Cenk Uygur lost his show in 2011 because “people in Washington” were concerned with his “tone”. Both Donahue and Uygur had good ratings. Whitewash: Cenk Uygur says MSNBC is afraid to speak truth to power because it is afraid of losing “access” to top people in government. As if it were People magazine covering Hollywood. Liberal bubble: When Chris Matthews, for example, talks about gun rights or gay rights, the Republican point of view is limited to recorded sound bites, which he then talks about with guests who hold pretty much the same liberal opinions that he does. It looks like they are debating issues, but you are listening to an echo chamber. Gone are the days when Rachel Maddow on the left and Pat Buchanan on the right went head to head. Update (February 29th 2016): MSNBC is becoming markedly Whiter and seems to be moving to the right. They got rid of Melissa Harris-Perry, got rid of Joy Reid’s show and moved Al Sharpton to the weekend. Tamron Hall is the only Black person left still shown regularly during the week, and she has no apparent editorial control. Meanwhile, they hired Rick Tyler, former spokesman for Ted Cruz, a hard-right Republican. After Cruz fired Tyler for spreading lies about Rubio on Twitter, MSNBC scooped him right up. MSNBC goes on and on about Donald Trump, like they cannot get enough of him. They show more than just sound bites from his speeches. Sometimes it almost seems like a Trump infomercial. News was supposed to be unbiased with no hidden agenda, but as we can see, it’s no longer the case. It’s from the point of view of white liberals and white conservatives, delights in celebrity exploits and has pushed journalism into sensationalism. To me, the news is dead. I enjoy Melissa-Harris Perry’s commentary. She covers everything that is going on with marginalized groups. She has fresh and intelligent commentary on what is going on sociologically and politically. I like that she is objective and unbiased. I plan to read her book Sister Citizen as well. I read the BBC world news mostly, RT is interesting mostly for it’s cynical view of America, CNN’s ok for so and so did the crime of the day… other than that, msnbc is like a left-wing fox news. We have an almost equivalent of FOX News, but I don’t think it is possible to be as bad as them, I mean as right-wing and on TV in France. I don’t think MSNBC want to be “unbiased”, they want to be be news that challenge FOX’s approach, and it’s a good thing, because I don’t if you watch FOX news… I don’t even understand how it is possible to utter such nonsense all day long. I prefer biased journalism that says something to seemingly unbiased journalism, like the French type one, that doesn’t say anything and *omits* a lot. Excellent Abagond. That was refreshing to hear. MSNBC roll out these talking heads that never sway from the programmers agenda and assume everyone will just go along with their bull. It is too obvious to ignore. No matter how stupid they think we are. Oh yes, Tamron Hall. I added I picture of her. By the way I think Cenk Uygur is absolutely right when he talks about access to top white house people and such. But I think that it’s more than that. All that stolen stimulus money seems to have found a home. Comcast is shady too. Where and how did they come up with the money to buy out an original network? As a young, Black woman, I don’t watch MSBNC or FOX News. Both news networks are biased and news shouldn’t be so biased. I believe news should be accurate and not based on the political or emotional views of other people. Don’t read or watch MSNBC or Fox News. Fox News is available on broadband here, but I also found it to be “For entertainment purposes only.” Pure tabloid. Is there any news agency out there not sponsored by political parties? I also like to add that news it supposed to question power and not cover for power. Probably cell phone videos of what’s really going on in the streets and posted on youtube. I can’t think of one American Network that isn’t owned by corporate elite and not riddled with the infusion of political drivel and contrived issues. I really don’t watch the news anymore… their propaganda shows through pretty badly these days. I switch around and I do watch MSNBC sometimes just to see what they are up too. Most of the programming today centered on the talks in the supreme court surrounding gay marriage which I thought was a state issue. I mean when you leagally get married the state you are from is the one that does the paperwork not on the federal level. Anyway, I thought it took away and distracted another ruling the supreme court recently made on GMO’s and the main US company producing them… Monsanto. They won a Supreme court ruling regarding their genetically altered soybeans. With no national media coverage….hmmmmm. Apparantly, besides the fact that GMOs have proven to be harmful and cause sterility in some animals, the companies that produce these farm seeds have a monopoly on the crops. Not only on the first generations of seeds but on the seeds of the seeds and so on. So farmers will have to pay out the arse to use farm seeds for generations to this company. Who knows the long term dangers of genetically altered crops….., they could go extinct and we could all starve. To me this is more important than the Supreme Courts take and opinion on Gay marriage. We’ve been duped again batman. OMG! I didn’t know that ruling came down already! And you’re right! No “think tank” on the meaning of this.I’m just…wow. The media is one of the four most powerful social institutions that shape America, rivaling the family, the schools, and peers. In fact, mass media is referred to as the fourth branch of government. The politicization of the media should come as no surprise. What with the progressive buyouts of smaller media outlets by megacorporations, we have our entire pool of news sources oligopolized by six or seven major companies, a much smaller number than decades before. Consider your news to be “democratic propaganda” sanctioned by the state. MSNBC could and should have been better. But almost all of its hosts repeat the White House talking points of the day. They are also locked into the Democrat vs. Republican framework and seemingly view just about everything through that lens. The idea that there might be left wing opposition to drone attacks and spying or right-wing opposition to wars and assassination is beyond them. And while I generally respect Sharpton for some of the work he’s done, he’s a horrible TV host. The constant yelling and frantic searching for the teleprompter is no good. When he’s giving commentary on other shows he’s better because he turns his volume down. But on his own show it’s all outrage all the time about whatever the Evil Republicans are doing. All these channels need to hire just blacks, only. Interesting, this kind of media bias exist everywhere and it is especially sneaky in countries that proclaim themselves “free and having an open debate. In Swedens national “neutral” state owned television the SVT (basically Swedens BBC) it has recently been exposed that a whopping 52% of its journalists sympathize “the Green party”. which only have about 6-7% of the votes and is basically envirement-focused Communists. ( and no not in the clueless way rednecks and angry republicans call Obama communist when he dares to even move an inch towards the centre) im talking about actual communists, which of course has led to this party never ever being critically judged by the channel… And since the SVT. is stateowned this should be considered a problem for the proclaimed neutrality but then again it is SVT that is supposed to be delivering news like this…..
I’ll be using that “Big Brother Obama ” pick for one of my “Amusing Ourselves to Death” analyses/summaries. Is that alright with you? This speaks in volumes about the sad state of american news journalism in general Check out how many national channels and papers you guys had in the 80’s and compare it to what you guys have now. Terrible situation. That was funny. “Enviroment-focused communists”. 😀 Did you miss the collapse of USSR and Eastern Block too? The Communists died out more than twenty years ago plus: there has never been real communists in Sweden, just some kids of the elite with too much time in their heads to fill with their dream soft core version of it intellectually, but not for real. on Fri Mar 29th 2013 at 00:55:27 B. R.
I mean, Sam, do you care to comment on what is going on with North Korrea now and that communists dont exist? Its funny, where I live , there is a communist party, talking there dogmad , stiff , rhetoric….I guess Cuba isnt communist , huh? All Green parties are socialist parties or certainly lean towards socialism, It’s the same in Britain. Also, for one, the fact that they are such a small party means they will not face the same scrutiny that the major parties face and two, the fact 52% of the journalists sympathize with them doesn’t seem to have made them any more popular with the electorate and three, all journalists have sympathies for the parties of their choice, it’s whether they communicate this fact that is important. American news was deregulated years ago, impartiality was thrown out and opinion was embraced, hence your Fox news and MSNBC’s. The problem is that people still take the ‘news’ on these channels at face value when they are really just politically biased opinions. I’ve really stopped caring about American news. People may as well be watching E! with how the major news channels do their business. I never watch MSNBC ever. Very biased network! I hate Fox News and to me, it is a rightwing hate machine. I hate bias in news and how did thenews become some biased? The only reason I listen to msnbc is for Melissa-Perry- Harris. And Tamron Hall is a great commentator. Just for those two sisters. Here’s my thing on FOXNEWS. O’Reiley and Hannity are anti Obama just cause from the beginning. Now that they have much dirt on him they are actually making sense. But if he did a good job they would still be against him. Also when Bush was president the right wingers on Fox were almost as bad as MSNBC but not quite. I like Rand Paul. I think he stands for us with no agenda. it’s gonna be 16 years of puppet presidents. Obama is worse than Bush IMO because he actually has a brain. He was a constitutional lawyer and swore on the bible to uphold the constitution yet he seems to do the opposite. Was there a time that the news wasn’t bias? I don’t get to watch too much news especially American news, it all seems like it game show host. Still MSNBC and FOXNEWS have a way to fall before they come out like North Korean style. I find it a rare bird when and if I find unbias news. I watch the BBC but they aren’t perfect either. People want to hear what they most value or believe in. Then after that it is the Roman philosophy of entertainment over substance. I do not own the rights. Like nearly all my pictures I found it on Google Images. Luckily it don;t make national headlines, but the locals gotta go. Cenk Uygur has an interesting YouTube show called The Young Turks. Why should they stop reporting news like that? I watch the Colbert Report quite regularly. Stephen is the best at combating the lame stream media. I think Racehl Maddow was the first to break the drone story, she was criticizing the obama administration days before the election. I like The Young Turks. they lean towards socialism but read their manifestos and you will know what I mean. and btw Is it in any ways healthy that such a small party has that much power over state owned television? and this party is rising tremendously in polls while there simply has not been any form of critical review of their policies which I cant possibly imagine why. Update: MSNBC is becoming markedly Whiter and seems to be moving to the right. They got rid of Melissa Harris-Perry, got rid of Joy Reid’s show and moved Al Sharpton to the weekend. Tamron Hall is the only Black person left still shown regularly during the week, and she has no apparent editorial control. Meanwhile, they hired Rick Tyler, former spokesman for Ted Cruz, a hard-right Republican. After Cruz fired Tyler for spreading lies about Rubio on Twitter, MSNBC scooped him right up. MSNBC goes on and on about Trump, like they cannot get enough of him. They show more than just sound bites from his speeches. Sometimes it almost seems like a Trump infomercial. @Abagond: You must have read my rant in the open thread about this. I am “Hot as fish grease” about MHP. She was apart of my morning weekend ritual. MSNBC did her dirty. I knew it was too good when black could speak freely and vent about all the social injustice and all the other things that affect our community and they (YT) not have something to say about it. I go to the comments section and read all the racist hate and vitriol which is an accurate barometer for the climate of this country. I guess with Obama leaving office they wanted to tear my little playhouse down so that’s why they are changing the goal post. “Urggg!! !